The initiative for this project arose from the discovery of the important new site at Tai Cochion. Here persistent reports to the Trust's Portable Antiquities Officer of Roman finds recovered by metal detectorists at a farm near Brynsiencyn, resulted in a programme of geophysical survey and trial excavations. This work identified a hitherto unknown and extensive Roman civil settlement; a site which is so far unique in NW Wales. There are other sites which have been brought to the Trust's attention over time by metal detectorists and others who have recovered significant finds from areas where currently no archaeological remains are known. In addition, there are numerous findspots already listed on the Historic Environment Record which particularly stand out as warranting further investigation. It is likely that some of these represent archaeological sites of importance waiting to be discovered. However, because of their lack of known context, findspots and hence the potentially important sites they represent, are often excluded from the usual forms of protection, particularly with respect to agri-environmental schemes such as Glastir. South-west Anglesey was chosen as the study area. Existing site records from various sources were interrogated to create a list of all of the known findspots in the study area. These were filtered for finds where type, date and location were confirmed. They were then sorted into categories such as casual single finds, concentrated scatters, dispersed scatters etc. 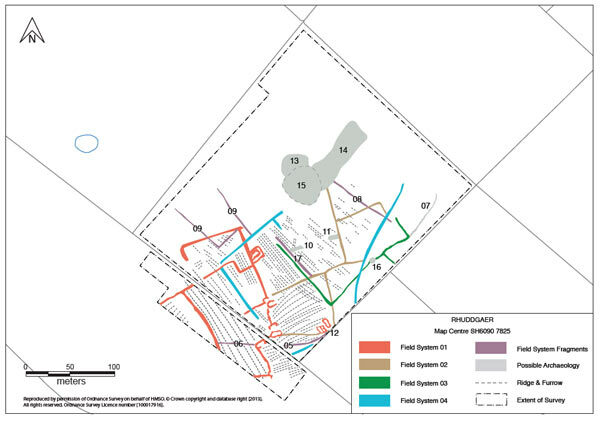 Fifteen sites were chosen for rapid assessment using a combination of desktop, fieldwalking, metal detecting and geophysical survey. The metal detecting survey method evolved during the project, and eventually resulted in discriminating for non-ferrous objects, and recording each findspot with a handheld GPS. Of the 15 areas surveyed, only one (Bodlawen) produced no archaeology whatsoever. Two areas produced sites potentially of national importance; nine areas produced sites potentially of regional importance; two areas produced sites of lesser importance; one area produced a site of unknown function or date. The project resulted in the identification of a significant number of new sites, although in some cases the sites were unrelated to the finds which had initiated the work. It is possible that intensive settlement and exploitation of the landscape in this part of Anglesey over a long time period means that there is a good potential for significant buried archaeology surviving within a high percentage of the landscape. The best results were obtained on sites which produced multiple finds. This may be because the single finds investigated are casual losses and so are not associated with any archaeological remains in the area. It is also possible that because they are single finds they are the product of a single feature or pit. There is a limited resolution to the geophysics and so features below a certain size, perhaps anything less than 2m diameter, are difficult to pick out especially against any background noise from the geology or soil. The features need to be reasonably large and with a recognisable morphology to identify them in a geophysics plot. 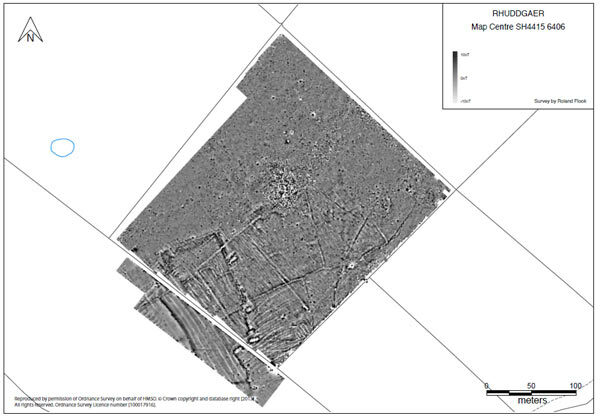 Recommendations for further work include wider magnetometer survey in areas where new sites have been identified, in order to ascertain the full extent of the archaeological remains. Limited trial trenching should accompany the survey to identify the survival and nature of the buried archaeology.